Improve search engine visibility (SEO) and lead flow from organic search for axway.com in all verticals and horizontals. Axway had already undergone past SEO work and was looking to further improve both volume and relevance of organic search traffic. Being such a large site (over 6,000 pages) created difficult SEO issues that needed to be addressed. Being such a large site, Obility suspected that there were multiple technical on-site SEO issues that were suppressing rankings, and so Obility began with a technical SEO audit to uncover problems hindering SEO compliance. After a full catalogue of issues was compiled, Obility then provided SEO solutions for each. For certain errors (like duplicate content, for example), Obility was able to see patterns emerge and was thus able to pinpoint root causes (like CMS settings) that could be fixed to prevent future problems. All of these action items made up Axway’s ongoing SEO Strategy, and each issue or collection of related issues were prioritized to aid execution and ensure that time spent was on the highest impact action items. 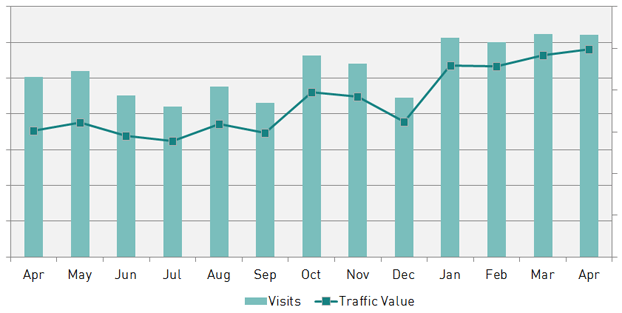 Over the course of the next 12 months, Obility instituted monthly website crawls to both mark past issues as “solved” as well as continue to identify new SEO problems as they arose for immediate correction. Once the technical site issues were all identified, Obility started the second phase: expanding past keyword research to identify niches and keywords not currently being targeted on the Axway website. Obility began by taking inventory of the site’s hierarchy, gathering competitor keyword targets and researching top niches, like healthcare and financial services, in order to identify previously missed keyword opportunities. Although monthly search volume is important, Obility gave extra weight to keywords that the team believed would generate high quality prospects (highlight in callout box), even if some of those keywords had less monthly searches. Once complete, Obility had identified over 340 keywords, categorized them all by niche as well as buying cycle stage to ensure proper targeting and prioritization. Following input from Axway’s subject-matter experts, Obility developed a content creation plan based off the keyword research, which identified new pages that needed to be included on the website to expand keyword rankings. Obility calls these pages “tertiary” web pages, as they are often not part of the primary navigation structure. For 12 months following this research, Obility worked with Axway to properly create and upload these pages onto Axway’s website with proper META tags and on-site targeting, and set up tracking metrics to review progress. Axway’s award-winning solutions span business-to-business integration and community management, managed file transfer, API and identity management, and email security — offered on premise and in the cloud with professional and managed services. Axway leverages these solutions, along with its deep industry expertise, to help customers govern their data flows across such industries as Financial Services, Automotive, Manufacturing, Consumer Packaged Goods, Retail, Healthcare, Life Sciences, Technology, Transportation & Logistics, Government & Public Sector and more.